I now have a system tray icon (those little ones by the clock in Windows) that looks like a Trifuel flame. And if I hold the mouse over it, a little box tells me the exact countdown to Vineman. If I right-click on it, I get the options of showing or hiding the actual application (which is just a countdown box that appears on the desktop) or exiting. Woo! I’m pretty excited. Especially since it will be very easy to customize for other races. I could do whatever icons I want, and countdowns to any dates and then any titles (right now the application titlebar says “Vineman”. In fact, I might write a program so that all I do is enter the new title and date, and maybe icon, and it makes a countdown for me. It was a great weekend. Not only was Monday off, but after a crazy week at work I had much of Friday off as well. Friday I went for a ride. Planned to be gone about 2 hours. I knew I was going to stop at the LBS (squeaky pedal), but figured I could still get about 1 – 1.5 hours in. Left about an hour or so later than planned (work distracted me). Then only got in about 30 min… because the bike shop boys distracted me. I ended up talking with them for about 1.5 hours. All good though… ended up with getting the Park Tools bike maintenance book later that evening, and then some hanging out (note: fireworks and alcohol and sword fights = bad combo). Got home Saturday morning at about 2 am! The shop ride was at 7:30, and I still wanted to make it. Of course, that meant I couldn’t fall asleep… but made it to sleep by 2:30 or 3ish, and up at 5:30 so that I could get to the ride. It was a good ride — we road the San Gabriel Dam Recreation area, and it was one of my faster rides of that ride. Just over 2000 ft of climbing, 36 miles, and 2:16 total time (a few stops to regroup). An average moving speed of 16.5 mph!! That’s flyin’ for me! A bit tired after those 36 miles, I got a drink and ate a fruit leather at the LBS, then back on the bike to get in some more miles for the day. After another 16 miles (in just over an hour — 15.4 mph with 1000 ft of climbing), I returned to the shop, threw on my running shoes, and went for an 8 mile brick run. The knee started aching a bit around mile 3, and was definitely starting to be unhappy by mile 7, but as it was an out and back I just finished it up and went home for some ice. Still was a good run — took 1:19 with an average pace of 9:35/mi, under the perfect-day-dream-goal for the IM! Sweet! The bike ride home after that (4.5 miles) was nice and easy, and it felt good to spin the legs. Sunday I again was up early, and off to the beach with my kayak! A friend and I took it out for just over 40 minutes minutes, and about 2 miles of paddling. We stopped for a while though — a sea lion was hitting fish, making them fly up above the surface of the water and panic, and was laughing and torturing them for fun. A pelican (the fatest one ever… it was decided he could eat me and I’d fit in his stomach) and a few seagulls watched with us. Then the sea lion tired of it, and became our guide through the water for a bit. I shocked myself and actually caught up to the front group at one of their regroup points! Of course they immediately dropped me once moving again (which was right as I got there) but Scott stayed with me and told me to jump on his wheel. We held about 19-20 mph the rest of the way to the beach (when not dodging other bikers and dogs). I just felt strong and comfortable in aerobars pretty much the whole day. I got to the beach… and was the first girl to do so! Wooo! I figure that’s all the rides I’ve done with the strong LBS guys most weekends paying off. They make me push it, and I think it has helped. I mean, really… my average is often just around 15 mph… and check out the *2* yes *2* 50 milers I did over the weekend — one at 16.2 mph (and enough left to run hard and then feel worn out) and the other at 18.6 (and left feeling energized and ready for the day, tons left to give)!!! 35 minute ocean swim once at the beach. The water was so nice I didn’t want a wetsuit, but wore it for the practice. At least I got my non-wetsuit water time with the kayak the day before. Drove back, ate pizza, stayed at the LBS chatting ’til one of the strongest guys, Mike, who rode both ways AND ADDED ON ANOTHER 25 MILES got back. And what miles did he add? Oh, he added climbing GMR, among other things… which is one of the toughest climbs in the area that I’ve done. Dang he is strong (and cute, of course… aren’t all biker boys??). I went home soon after that, and read and slept on the couch for most of the rest of the day. I’d say the weekend was a good one! I just read a post from an IMWI person, talking about how 100 days to go. Umm… wait. 100 til WI?? Uhh… that means Aug 12th is even closer… AAAAHHHH. A bit of panic set in. I don’t have time for you now. now to get with it…. 74 days to the test. For street running, in January (when I started to do really HR training) I averaged 5 mph and did about 86 miles. For street running in February I averaged 5.5 mph but only did about 53.5 miles. For street running in March I averaged 5.6 mph for 54 miles. For street running in April I averaged 5.7 mph for 61 miles. And so far this month (although it has felt like not many miles since the race has left me SORE!) I’ve averaged 5.8 mph and gotten in 49.5 miles. Ok, so really I don’t have the Paleo for Athletes book yet, and so I can’t really follow all the details yet. But starting today I’m focusing more on lean meats and proteins, and more on fruits and veggies (and less on carbs, but hey I heard to focus on what you can eat and I prefer that method). So far it’s going pretty well — dunno where soup fits in the mix, but the ingredients were mainly corn and peppers, so I think it works. And salad. Mmm I love salad. And have a great new raspberry dressing from Trader Joes. We’ll see how long it lasts, but this is my putting it in writing: here it goes. Well… I can tell I’ve been pushing it lately. Which is odd, since I feel like a slacker. I think it’s mostly from the race. Although I worked from home the day after, and even though I had only 2 or 3 very light workouts last week, I never really got in a good sleep session. I felt it on Saturday. Went out for a ride, planning to do 60 – 80 miles on the bike. The LBS ride ended up being about 30, and I was just exhausted. My knee was sore, and not in a good way. So I called it a day. Home to food, ice, and sleep. Wow. I think I slept almost all day. Reading and sleeping on the couch, and then had dinner and frozen yogurt with some friends. Felt much better after that, which was good. Sunday was the long run. I went a bit over 15 miles (the plan called for 15-18), but the knee was not happy (from around the midway point, but it was a big loop so I just sucked it up since it wasn’t awful). The end of the run felt really good though. Stiff and tired muscles, but they were happy to be moving. Then it was more ice, and then shopping and food with friends. I got a very cute bike skirt. Yes, bike skirt. It’s blue and has bright flowers on it. I’m excited :). Also got a new swim suit, although not one I plan to race in! First year in I don’t know how long that trying on swim suits didn’t make me feel completely awful (as far as body image) for the rest of the day. So that was a nice surprise. This is another light week, trying to keep the knee happy. I think I figured out why it was sore. My cleat placement had been a bit off on the bike shoes, and commuting with them that way made it a bit achey. And then I remember that I did slid at one point in the race last weekend, with that leg being the one that ended up bent back and under me. So I bet it was the combo. Some tiger balm last night, and swimming this morning, and it is a lot more comfortable than yesterday. Yesterday it inspired a bad dream, and had me work from home since I drive a manual. Right now I’m hoping to get back into the workout pattern again. Adventure races always seem to throw it off a bit for me. They are great fun, and I wouldn’t give them up, but that’s the truth. I think they also make me stronger though, so it’s a trade-off. Oooh… and got a raise at work! It’s always great when it is made clear that you are appreciated and the stuff you do doesn’t go unnoticed. It may mean new-toy-time. Or a fun race or other outdoorsy trip. We’ll see! Now to do more of the working part. This was after the first part of the pack raft section. So my toes are still all blistery from the weekend. Which meant bike commuting just sounded no fun, so I have driven the last 2 days. Teach karate on rough carpet barefoot opened up at least one (at least they aren’t all goopy inside at this point… drained but still a bubble of skin). I was a bit worried about swimming with them (since pushing off the wall seemed like asking for trouble) but they were ok for the pushing part this morning. However, what did get to them was just kicking… I could feel the water on them is such an odd way! It wasn’t a big deal though… I just swam with my toes sorta holding each other together, and it was only 1200 yards. At least the blisters are getting better, and the majority of foot pain from the other raw and abused skin is also gone. cactus, snakes, big horn sheep and carp. This race would prove the shirt wrong — it made it sound too easy. Our team journey started Friday morning. Packing was finally done, and it was time to head out. 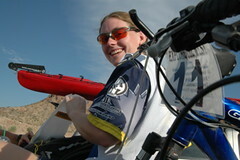 Paul picked me up, and we headed out to Boulder City, NV, ending with our fingers crossed that we’d make it into town. Although he knew he could make it to Boulder City with a quarter tank of gas left, that was off a full tank from Barstow. Not a full tank from Claremont. “32 Miles from Boulder City”, the sign said. A few miles later, the gas light was on. With a light load, the truck gets about 40 miles from the light coming on. Yet today we had the truck packed and overflowing — stuff for us during the race, and a few things the race directors Paul and Karen asked Paul my teammate to bring out for them. The gas light on, and the needle past empty, we glided into Boulder City and Paul put more gas in the truck than he ever had before. But we had made it… one situation down, and into race mode! We headed to the race start, where we met up with Mark, our other teammate. 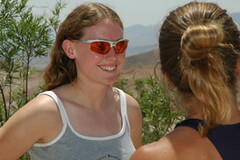 He raced Baja Travesia with Paul in December (a 3-5 day race), but I’d never met him. Another issue was brought up at this point: how were we transporting boats? Paul’s car had no rack on it, and Mark had one boat spot. But we had 2 kayaks (a double and a single) that we had borrowed from Paul and Karen. Our support crew of one person (Geoff) was planning to drive Paul’s truck, which would fit the 3 bikes (which Mark’s XTerra would have trouble fitting)! We were too early to check in anyways, so we headed to Desert Adventures to check out our boats and see if we could work out a deal to get them to transport them for us. They were already doing transport for all the boats rented from them, and our boats were already at their store. We didn’t get a really solid answer, since there were a few factors left to be determined, but we crossed our fingers and waited to find out on race morning. Talk was centered around course guesses, and Paul was constantly looking for clues. When he got the t-shirt, it was no exception. “Up the Colorado River?? Over 100 miles?” We had a guestimate on how the course was going to go, and although this still fit most of our guesses, we started to wonder how long the course really was — it claimed to be 12-24 hours. But if that was a Paul and Karen 12-24, we should be ready for a few days out there! Registered we headed back to the kayaks to wax them. Uhh… yeah… great idea… wax kayaks (where I was rubbing it off) in the heat of the day, in the sun, the day before a race. I was being soooo good to be hydrated for the next day, and I think this mistake caused most of my heat and hydration issues the next day. While waxing I could feel energy draining to where I finally had to stop, and just sat in the little shade the boats provided. I didn’t feel that awful, but I’d remember the feeling very quickly during the race! We then found and set up our campground and did some basic race packing while waiting for our Team Mom support guy, Geoff. We got packs with pack rafts ready, and then figured out the easiest way to attach our paddles: put them in the large mesh swim bag I had and they attached to his pack in an outside pocket with straps through the mesh bag straps helping hold them there. It was going to be my paddle and Paul’s on his pack, with Mark having his own similar set up, but when we got to the section it turned into having all three sets there as Mark’s bag had been left in his car back at the start. Tired from a long day, I soon crawled onto my sleeping bag in the back of the truck. Paul gave Geoff a final call with directions, and we hoped he’d show up in the night. Around midnight he did pull up, and I told him to go get in the tent with Paul and rolled over and went back to sleep. We were up bright and early, did our last minute packing, and heading to a great breakfast at the Coffee Cup, one of the race sponsors. Then off to the start for last minute organizing and the race meeting. We found out the planned course, and our guess had been pretty close! We ploted part of the course, and then hurried to get on our bikes for the start. Our mountain biking started with a fire road climb — nothing too exciting, but it spread the pack out. I was definitely the limiting speed factor for my team here (as I was for much of the race). But I was feeling pretty good. It was a gorgeous morning, and great area! We turned onto the single track, and although a bit nervous with my limited mtb skills, it was a very fun course. One of the straps on my pack broke about 45 minutes in, so there was some knot tying, and it was not staying in place well the rest of the day. It threw off my balance a bit, but was nothing compared to what was to come. We got CP1, and continued on. Within about an hour or hour and a quarter of starting the race, I started to get very very overheated. I was drinking fairly constantly, so I think it was mostly a heat issue. Oh and those kayaks that we waxed the day before? Yup, it started with that same feeling, and remind me of them. “They better fly after all that,” I thought, struggling to steer my bike and fighting with very slow reaction time. CP2 was found, and we were heading to CP3, which was also TA1. I kept drinking — water and gatorade — and took some eCaps. It got a bit scary once I was getting cold. Goosebumps and everything, and shakey. Not good with a full day of sun ahead! For the last part of the ride, my whole focus was on getting to the transition and dipping my hat in the ice chest. I don’t even usually like or wear hats! We made it to TA3 at last, and found we were in 14th place. We’d thought we were dead last after our slow bike leg, so that was reassuring. We got filled with more water, and added some water bottles with our packs as well, knowing this next leg would be hot hot hot, and long. Oh, and I did get my hat dipped in ice water and filled with ice. I did so a few times, actually. And then it was time for a trek from Bootleg Canyon to Lake Mead — around 15 miles, no real trails, no shade. A race meeting predicted time of 3-5 hours, it was going to be important to have enough water. Starting at 11:20 am, it was only going to get hotter. I was feeling tons better just by cooling down, and we started our next leg at an easy jog. With a jog/walk combo across the trickier footing areas, we headed straight at the peak where we thought we’d find CP4. We found the volunteer’s truck for it, and although we first picked the wrong hill, we did find CP4 just over that one, and it wasn’t a bad climb across to it. However, again we had been in the sun long enough that I was started to feel the effects again. This time never to goosebumps, but my hands were alternating between throbbing, pins and needles, and being numb. I could barely move my fingers for much of this leg, and hoped it would go away quickly once the leg was over since the kayak was next! But first things first… we have to finish crossing this leg of desert. So I had a new goal: making it to the lake, and again water and cooling down. We scrabbled down a fun canyon (complete with a dead and stinky big horn sheep, many lizards, and a ground squirrel). Reaching a patch of shade, we took a quick break, and I got down some food and ran out of water. Uh oh… we had some water left in one of the camelbacks, and 2 or 3 bottles with a bit of gatorade left in each one. Time to just keep moving. Across more desert, to an old road, and across the new one. Paul took my pack, helping me keep cooler. We found a picnic area, and used the map to double check where exactly we were. While doing so, a couple turned into for a picnic. As there was no water fountain at the site, we ended up going over, telling them what we were doing, and see if they had any water to spare. Not only did they have water, but they had ice! So more ice in my hat, and ice in waterbottles, and we felt somewhat alive again. To make it even better, the lady’s name was Dora. Great since one of my AR mantras is “Just keep swimmin’!” from Dory in Finding Nemo! After they were our waterheros, we crossed the main road again, back to the old road, and followed it right down to where the boats were at CP5/TA2, arriving right around 5:15 pm. To our surprise, we arrived in 8th place! It was a tough course for everyone. “Anything can happen in an AR!” as Paul said. After those 7 hours of sun, it took a bit more to really get cooled off again. That shirt I was using to wipe wax off of boats the other day became a friend as I laid it over me after it was dipped in the cooler. With a buff also dipped in the cooler, and hat, and a sandwich break, it was time to get moving again — now in 7th place as some teams were taking longer in transition. We decided to put the boys in the double and have me in the single, towed behind. This ended up working really well. At times I even kept some slack in the rope between us, which is great for me. We moved fast, although not as fast as the team that left about 15 minutes before us! Team Kayak Lake Mead knew what they were doing in this kayak section on Lake Mead. Their name comes from the company they run… and padding is definitely their thing! They did an awesome job, getting to CP6 about 50 minutes before we did, and we didn’t see them again during the race. During the kayak trip to CP6, darkness fell and we broke the glowsticks on the front of the boats. There was a full moon, which we were thankful for, as it meant there were still mountain and shoreline features visible. One of the fun parts was that Lake Mead, often smooth as glass, was instead a bit choppy — we got to face about 3 ft swells and headwinds of about 20 mph! But happily I didn’t turn over the boat, and our bailer was not needed. Although in a cockpitted boat, I didn’t have the spray skirt on but behind me, and when it was getting really choppy it was a concern for a bit that too much water was going to get in. We made it to CP7/TA3, where Geoff had Jumbo Jack burgers waiting for us! Wooo! It was about 11 at this point, so our guess of 8 or 9 pm meant they were a bit cold. But they were still good, and we watched the glowsticks of a few teams behind us cruise into the bay as we ate. We knew the teams were a bit bunched here, so we got the rest of our plotting done, set up the paddles on the packs, and grabbed our packs full of pack rafts as we headed out on the dirt road. The 2 teams next to us were dropping out of the race, and although part of me was envious that they were done, I was excited about the upcoming pack rafting, and knew I would be unhappy with myself if I stopped after all that. 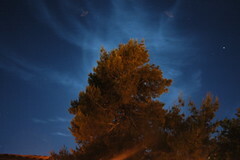 Besides, it was dark now, and although not cool by any means, it wasn’t as deathly hot. We had our only real navigation error on this trek: a misreading of the distance to the turnoff. So while we thought it should be about 6 miles, really it was more like 3. We went past it, and had to retrace until we found a spot that was either the one we were looking for or at least was one that would take us to the same place. We saw a few teams just over the road from us, and knew we were close to the checkpoint. We saw a light off to the left, and while decided if we really thought that was it, we found it was by talking to the person at it and then hiked our way over. From there we caught up to the 2 teams we could see ahead, Team Stride and a solo racer Ramon. We had picked a great line over to the other side of the highway, and the drainage ditched we crossed under the highway with was just about my size… I only had to hunch a little. Our three teams stayed together for a good part of this section, helping each other find our way down the canyons (with only a few falls and crashes, and luckily none serious). Here we were also with Paul (the race director one) part of the time, as he set ribbons to help teams through some of the sections. It was still somewhat a guessing game though as it had been Karen who had figured out this section of the course! We came to a few deadends, a few cliffs, and a few uncrossable areas. As one ended we figured out we needed to be a canyon over, and crossed over into it. At this point my feet were starting to die, and the other two teams pulled ahead. Right around 5:40am the sun started coming up, and as it was daylight we broke out of the canyon and found ourselves on a small beach directly across from the checkpoint! We were in the perfect canyon for knowing which way to head once we got to the river. The other 2 teams were no where in sight, and we soon found out they had carried one of the battery powered pumps that made boat inflation a breeze. Our foot pump took us some time, but while one person pumped the others made sure we were drinking and grabbed some food. Soon our pack rafts were inflated, and we paddled across to CP 9 and headed off up the river for CP10, with Karen kayaking a bit next to us. While paddling up the river, we saw Team Paddle Me exiting a canyon, and helped direct them to the CP which was a bit down stream. The pack rafts moved SOOOOO SLOWLY! The 1.5 miles seemed to take forever. At times I was defintely tempted to jump out and swim with mine, but since the river was about 54 degrees I just stayed in the boat and kept working at moving. Eventually we reached the spot for CP10’s canyon, and climbed out of the rafts. After a bit of a climb up the canyon we came to CP10, which was a warm springs and had a required 15 minute break. The warm water was nice and soothing, and washing off some of the grime felt great. While we were there, Karen let us know of some course modifications: Only one team was doing the full orienteering section, and one team did part of it. It was cancelled for the rest of us since the whole course was just taking too long for teams to get through! We were relieved, as after the pack rafts I had mentioned to the team that it might be smart of us to just take the full penalty for missing all the orienteering points and just move on. This eliminated us having to make that call, as well as the up to 11 hours in penalties we would have gotten! After the break in the water, it was just going to be a hike to our bikes at CP12/13 and a short ride to the finish line. The sun was up again now though, and the day was working on getting warmer. Since we had left in the dark, and it had been hours earlier, we didn’t have sunscreen, so part of the hurry of this leg was also to avoid getting too burned. Here Mark grabbed my pack — complete with PFD strapped on the outside — and again my feet were greatful for less stress. About an hour later we reached the top of the canyon, and then it was a 4-5 mile walk (I tried to run, but my feet were having none of that) down a dirt road to CP12/13. During it Team Stride and Ramon passed us again… where did they come from? Turned out they had gotten a wrong canyon on leaving the hot springs. 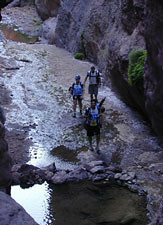 We got to TA4/CP12/CP13 around 10:45 in the morning, having hit our 24 hour mark while climbing out of the canyon. TA4 was a faster one for us — we could taste the finish! I put my manditory gear in my bento box on the bike and in a small hip pack, grabbed a water bottle, changed to bike shoes, and we were off. Ok so the change to bike shoes involved a few colorful and choice words as I crammed all the blisters into a new jail. But it was great to have no pack for this part, giving airflow over my back without adding more burden to either of the boys. Although a short ride, it was still hot! Here Mark showed awesome strength as he towed me up the few hills we had to climb to get out of the area the TA was in and back to the pavement. Once we hit pavement we flew… right to the finish line, up over the curb, and we were done. 26 hours and 24 minutes from when we started. The last team to cross the line, but, as announcer Paul said, “last but definitely not least”. I sat down, and off came the bike shoes and socks. Man that green grass felt great on my feet! A hard, tough race. I really didn’t know during parts if we’d be able to finish as a team. It was one of my toughest days ever, and I was lucky to have awesome teammates that helped me pull through it. Temperatures got over 105 during the race! My muscles aren’t too sore today, but my feet sure were after it (although much better today)! I have some blisters in odd spots… Unfortunately (and fortunately) the blisters are a reminder that I’ll have to skip one of the races in the series that I was really looking forward to: the Baja 24 hour race. It’s the week before Vineman, and feet and body won’t need such a pre-race weekend. We headed back to our campsite, and sorted what we could of our gear. And it was off to the airport, where I got on an earlier flight. Once on the flight, I fell asleep before it took off. And the turbulance woke me a bit, but I felt it was nothing and just went back to sleep. That 35 minute nap was awesome! I then made it home 15 minutes before Adam, who I was supposed to pick up at the airport… luckily Holly was free and came and got us since my car was at home. I then got to make the weekend a bit longer by driving Adam out to 29 Palms since he had to work in the morning… but it was only a 2 hour drive each way, and even on that little of sleep it wasn’t too hard – especially not compared to that race! It was a long weekend for sure… but an awesome one! I’m so glad I did that race… awesome team, challenging course, and great people at every CP and TA and along the course. You are currently browsing the Miles of Life blog archives for May, 2006.